The Marshall Cancer Care Center offers the latest oncology treatments and radiation services for the many cancers that respond to well-established treatment protocols. Many factors affect the type of cancer treatment a patient may receive, including the type of the cancer, where it is located, the stage of the disease, and other aspects of the patient’s health. Treatment methods range from surgery, radiation therapy and chemotherapy to hormone therapy, biological therapy, stem cell transplant experimental treatments and possibly other alternative therapies. Radiation Oncology – Includes the newest equipment/technology for the localized treatment of affected cancer cells. Medical Oncology – Includes comfortable treatment areas where family and friends can support chemotherapy patients during treatment. Affiliation with the UAB Cancer Care Network – Gives local healthcare providers access to ongoing cancer research as well as access to the latest information on cancer. Teamwork Concept – A well-rounded team of physicians, technologists and compassionate healthcare providers is a key element of the Cancer Care Center. Radiation therapy is a key component of many cancer treatments. In the past, that could mean lengthy radiation sessions which put extra demands on the patient. Thanks to the advanced technology of the Trilogy Linear Accelerator, Marshall Medical patients will benefit from much faster treatment times. Plus, Trilogy provides much greater accuracy, sparing healthy tissues to an extent not possible until recently. As one of the major investments at the new Marshall Cancer Care Center, the Trilogy Linear Accelerator will pay huge dividends to local patients. Combined with the experienced care of local professionals, Trilogy offers another benefit of having excellent cancer cancer closer to home. As the world’s premier radiation oncology society, ASTRO has created a series of patient education videos to explain what to expect when receiving radiation therapy for cancer. The link below takes you to the ASTRO website where you can view the videos. Greater and more timely access to cancer care via a convenient and easily-accessible location. Privacy, confidentiality, comfort and amenities for cancer patients and their families. Patient Navigator to help patients and their families facing an extremely challenging time in their lives. Special Resources include Support Groups, Nutrition Services and a Resource Cafe help patients maintain a positive quality of life while undergoing treatment, during recovery and in remission. 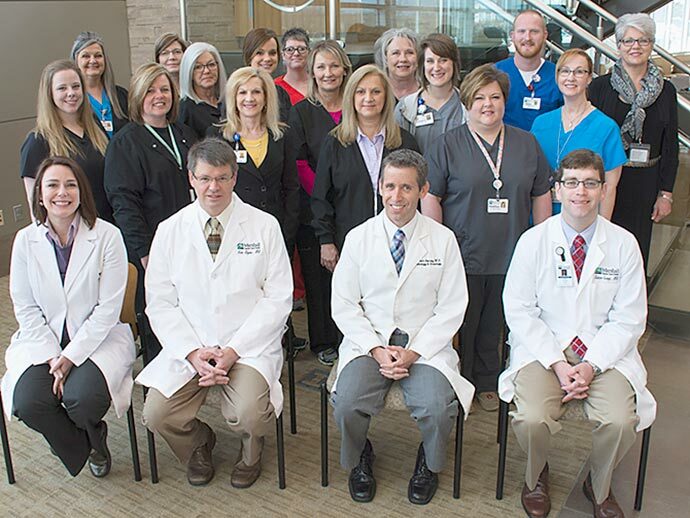 The physicians and staff at Marshall Cancer Care Center.